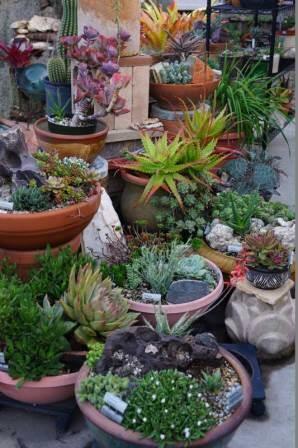 The January Featured Garden is a succulent garden. Some of the best succulent blooms occur in winter. 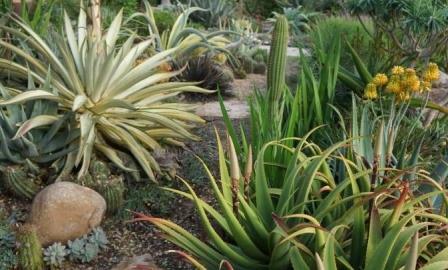 This garden showcases some of the aloes and other plants that put on a show at this time of year. SDHS is excited to be hosted at a beautiful home succulent garden. The owners are members of the San Diego Cactus and Succulent Society and will be hosting them in the morning and us in the afternoon. They are anticipating one of our newer aloes, Aloe 'Vulcan’s Fire' a bicolored red and orange one will be in bloom. Also putting on a show will be many other aloes and not to be outdone are three different plantings of Agave ‘Joe Hoak’ which should be in full bloom. Tucked around are many other succulents including Aeoniums, Crassula, Cotyledon, Mesembs, and a slowly growing collection of cacti. They have created more container plantings, most include rocks from collecting trips out to the desert. The owners will have some of their propagated plants for sale (cash only) as well as some landscape size plants (especially dyckias and hechtias) that are ready to move on to new homes. They will have baked goods and other items to nibble on as well as drinks.